This is a lavishly illustrated narrative that takes you right to the heart of the Great Plains landscape. Fascinated by the writing of Mari Sandoz (1896-1966), British writer Alan Wilkinson had visited her home state a dozen times over twenty years. He read a great deal about the early days on the Nebraska frontier, but wanted to know more. What would it be like to live on the western Great Plains for a season? Could he still get a sense of what those pioneers went through, a century ago? When a ranching couple offered him the use of an hundred-year-old hunting lodge, built by settlers on the banks of the Niobrara river, he shook hands on the deal before they could change their minds. The week after he moved in he was hit by an April blizzard. A month later his road was washed away by a thunderstorm. Determined to act out a part of the pioneer experience, he planted a garden. The first was wiped out by hailstones, the second by grasshoppers. He spent the spring and summer hiking the hills, exploring the riverside and digging into the history of the Danish immigrants who graduated from a dug-out to a sodhouse, then built the little red house that was now his home. He socialised with local ranchers, hit the bars and the rodeo, rode the range with Department of Agriculture surveyors, worked on the spring round-up and cut hay. In between he re-considered the life and work of his heroine, Mari Sandoz, re-visiting what remains of her home and camping out at her gravesite. This is a thoughtful work, a lyrical appreciation of place that remains firmly rooted in the author’s elemental relationship with a unique landscape, one peopled with a cast of genuine western characters, living and dead. Update: If you download the ebook on a regular Kindle (not a Kindle fire), you obviously aren't going to get the full effect of the wonderful photography. To accommodate those ereaders, Alan has placed all of the photos on a website, in the order they are found in the book. They are wonderful to enjoy on their own too! 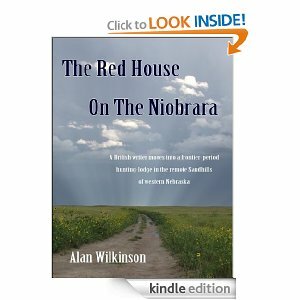 Alan Wilkinson has been a freelance writer since the 1980s, working mostly in non-fiction. He's written everything from TV soaps to ghosted biographies to newspaper features to company histories. He currently co-writes the Now Then Lad series (Hodder) with Mike Pannett. I have downloaded Red House on the Niobrara to my Kindle and will be reviewing it just as soon as I get it read. Thanks for stopping by. Download the book for yourself, pour a cup of coffee, sit back and enjoy! That's right neighborly of you (see, I got the US spelling), but my name is Alan WilkINson, not WilkERson. People often confuse that. Have a good one. Thank you Alan! I was going to update the post this morning with a link to your blog - which I forgot yesterday, so I got the spelling changed at the same time! Enjoy your travels - can't wait to delve into the book.